Week one shows the Vikings at home as they host the Jaguars in a matchup of two teams that sorely need to get off to good starts based on last season. 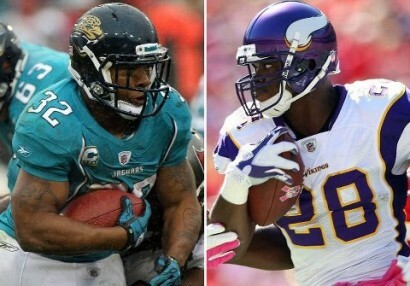 One key for the Vikings will be what type of run game they may get if they can throw RB Adrian Peterson back in the mix. The rusher could return a little more than eight months after undergoing reconstructive surgery on a torn ACL and MCL suffered December 24th at Washington. All week AP has said he will play, but in the end, he likely won’t see much playing time, and it will be up to the supporting cast of the Vikings to lead them to a win. The same could be said for the Jags, who do have a healthy Maurice Jones-Drew, but he isn’t set to start and probably won’t see more than 10 carries in the contest. Which means it could come down to defense, and what QB between Christian Ponder and Blaine Gabbert can make more plays in this matchup. Gabbert completed 50.8 percent of his passes for 2,214 yards, 12 touchdowns and 11 interceptions, and he has two new wide receivers to work with – free agent pickup Laurent Robinson and fifth overall pick Justin Blackmon. Ponder is also preparing for a better effort in his second year. He threw 13 TDs and 13 picks last season after taking over the starting job from Donovan McNabb. The Vikings are at home, and they have a better D with Jared Allen and company looking to make it a long day for Gabbert. Look for Minnesota to win a tight one, getting the better of this game of two teams looking to turn the corner in 2012.